Can a time tracking system save me time? Recently I made the plunge and bought a time tracking tool. Now, I have used multiple platforms over the years, and if you read my blog a lot you probably notice I have used different visuals to keep track of what I am up to throughout the day. In this case, I have been struggling with time tracking since having a kid, so I decided to look for a new service. Most of the free services I was using had some severe limitations. This included only being available through a browser and need to tracking time after the event, lack of syncing between a mobile device and computer, data collection and reporting were only offered under a premium service, etc. Every year I need to track different aspects of my job in academia, and with increased concern related to demonstrating outcomes based on time spent, I felt it prudent to be proactive to track my actions throughout the year. Consulting time tracking has increasingly become a focus for me, and I wanted something I could use to track external time worked on projects. Clean minamalistic UI. I can’t emphasize how often some tools I have used in the past were so cluttered it was infurianting to use on a daily/hourly basis. Integration across mobile/laptop synced apps. I can look on my phone and on my laptop to see what actions are occuring. Ability to keep notes on activities. This was a must, and I what I like is I can #tag actions (e.g., #blogpost) and @Person (e.g., @start-up company) to track who I was doing the action for. Now, one thing that Timeular has is a peripheral that is Bluetooth enabled that syncs with your laptop or mobile device to track time. This thing sits in a base, and you turn it on when you work, and then you flip it around. It has 8 sides, and each can be paired to an action (as you can see in my gallery above). Peripheral sitting in its base between use. Now, the use of this device for me has been limited to be honest. I don’t have one workplace throughout the day. I can in one day, work in my office at campus, in the clinic down the road, and then back in my home office in the evening. There is no way I am lugging this thing around. Now, if I only had one workstation I can see the use of this, as it is a quick way to say, switch from tracking email —> phone call —> email —> work —> break, etc for someone in an office space or at home all day I feel. Nonetheless, the days where I do work at my desk on hours at end I feel it is a cool tool to grab. I think it brings a certain point of focus to what you are doing, and I ask myself if changing actions is worth it. So what have I noticed so far? This has been one of the easiest tools I have used to track my work thus far. I like the data reporting features and ability to track intricate details for post-review. I spend too much time on email. I am increasingly paying more attention to items I do throughout the day. Seeing the clock tick-up as I work (as of now I have spent 40:40 minutes on blogging) helps me identify when I am slacking off or getting sidetracked. Time is more precious than before (as I have blogged before) as after having a kid I have lost effectively 1/3 of my work time I used in the past so keeping on task is invaluable. 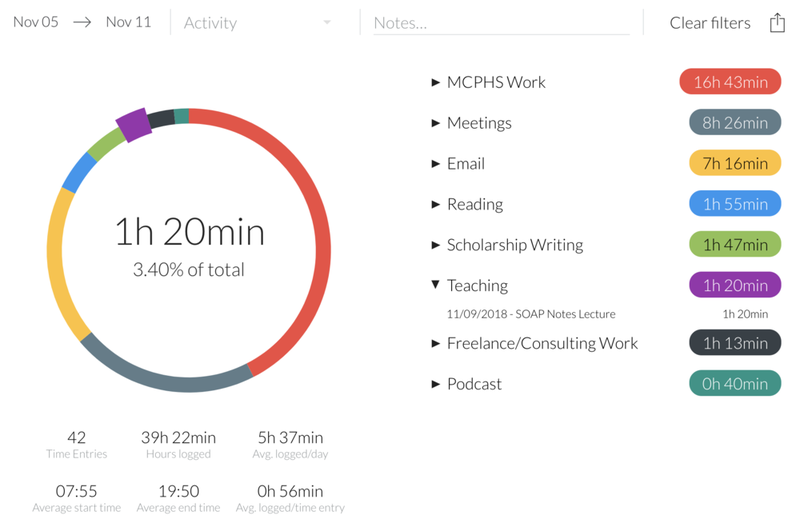 Now, I am using the pro edition, but I wanted the ability to track >8 tasks throughout the day. For some people this could be costly, but I have found it very useful after my first month and plan on continuing my subscription.